The Ebac SPP6A Dehumidifier is a smaller capacity unit for the protection of moisture sensitive, high value equipment and stores. Originally designed for NATO forces, to a demanding specification, the SPP6A is now in service with the defence agencies of several member countries of the alliance. This reliable and high quality unit is now available to the commercial and industrial markets where there is little doubt its special qualities will be in continuing demand. The Ebac SPP6A Dehumidifier is designed for the protection of high value, moisture sensitive items. A major requirement of such a unit is reliability. 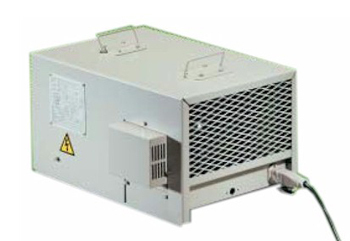 This dehumidifier will perform its stated function consistently and do so with the minimum possible risk of breakdown. It is built to military requirements and includes refinements such as hermetically sealed internal components to minimise maintenance, a copper refrigeration circuit for long life, integral refrigerant compressor cut-off device and stainless steel fittings throughout the entire machine. The Ebac SPP6A has been used by the military forces of a number of nations to protect stores, helicopters, fighting vehicles, avionics, simulators, ammunition, military aircraft, landing vessels, radar systems, aircraft drop-tanks, marine vessels, electrical switch-gear, land vehicles stores and aircraft engines. The reliance placed by military users on the dependability of this unit for the protection of such sensitive and expensive items is a tribute to the outstanding qualities of this machine. Military service demands levels of durability greater than those normally needed by civilian users and the Ebac SPP6A has been exhaustively tested for resistance to shock and vibration to comply with military transport requirements. The entire unit is encased in heavy gauge steel to complete the protection. All of these are specialised military requirements but there are a significant number of commercial and industrial applications where similar standards may apply. High value, moisture sensitive items are plentiful and a rugged, dependable dehumidifier will be required to protect them. One other characteristic of military establishments and some industrial and commercial sites is security. Highly secure areas are often only accessible to a few staff members with the necessary clearance and this would not typically include regular security and supervisory staff. The Ebac SPP6A is supplied with a remote monitor box which allows the status of the unit to be confirmed from outside the dehumidified area. This allows routine monitoring without compromising security and also avoids fluctuations in relative humidity caused by the need to open doors for entry. As a dehumidifier the SPP6A has all the essential qualities for even the most demanding environments. At 80°F and 60% relative humidity this unit will remove 17 pints of water per day from the air. In more severe conditions this may rise to as much as 25 pints per day. This capacity is sufficient for an area of up to 375 sq ft. (manufacturer's recommendation). The SPP6A is equipped for low temperature operation incorporating Ebac's hot gas defrost system which actively melts ice from the coils and ensures continuing effective dehumidification down to 33°F. Robust construction does not make for light weight and this unit weighs 61lb. It is, however, light enough to be a portable machine. The Ebac SPP6A is equipped with two folding carrying handles for carriage by one two individuals and with its proven resistance to shock and vibration it can be confidently transported between sites on a vehicle with no risk of damage. The unit is compact with exterior dimensions of only 13.5 x 17.5 x 10 inches which makes transport easier still and enables the unit to be sited conveniently in small spaces. A sturdy tripod platform is available to raise the unit a couple of feet above the ground. This is listed as an optional extra in Ebac literature but is listed as an included feature by at least one supplier. An additional option is wall mounting of the unit and a mounting bracket is also available, definitely an option with an additional cost. Other options include a voltage stabilizer and a unit configured for a 240V/50Hz power supply, the latter entailing a number of weeks delay between placement and delivery of an order. The Ebac SPP6A includes an adjustable humidistat to regulate relative humidity to a constant value. This secures the safety of stored items, particularly if they are sensitive to fluctuations in relative humidity as well as to excessive moisture. This device will cycle the unit on and off to maintain the ideal level and is also, therefore, an energy saver. As might be expected the SPP6A is capable of continuous drainage, by means of a gravity feed. This requires an adjacent drain at a lower level than the discharge port in the unit. If such a drain is not immediately available a separate condensate pump will be necessary to force the condensate over a greater distance, or to raise it to a higher level.